The Book of Joshua (Hebrew: ספר יהושע‎‎ Sefer Yĕhôshúa) is the sixth book in the Hebrew Bible (the Christian Old Testament) and the first book of the Deuteronomistic history, the story of Israel from the conquest of Canaan to the Babylonian exile. It tells of the campaigns of the Israelites in central, southern and northern Canaan, the destruction of their enemies, and the division of the land among the twelve tribes, framed by two set-piece speeches, the first by God commanding the conquest of the land, and, at the end, the last by Joshua warning of the need for faithful observance of the Law (torah) revealed to Moses. Almost all scholars agree that the book of Joshua holds little historical value for early Israel and most likely reflects a much later period. Although Rabbinic tradition holds that the book was written by Joshua, it is probable that it was written by multiple editors and authors far removed from the times it depicts. The earliest parts of the book are possibly chapters 2–11, the story of the conquest; these chapters were later incorporated into an early form of Joshua written late in the reign of king Josiah (reigned 640–609 BCE), but the book was not completed until after the fall of Jerusalem to the Neo-Babylonian Empire in 586 BCE, and possibly not until after the return from the Babylonian exile in 539 BCE. Chapter 1 commences "after the death of Moses" (Joshua 1:1) and presents the first of three important moments in Joshua marked with major speeches and reflections by the main characters; here first God, and then Joshua, make speeches about the goal of conquest of the Promised Land; in chapter 12, the narrator looks back on the conquest; and in chapter 23 Joshua gives a speech about what must be done if Israel is to live in peace in the land). Methodist writer Joseph Benson suggests that God's revelation to Joshua comes "either immediately after [Moses' death], or when the days of mourning for Moses were expired". God commissions Joshua to take possession of the land and warns him to keep faith with the Covenant. God's speech foreshadows the major themes of the book: the crossing of the Jordan River and conquest of the land, its distribution, and the imperative need for obedience to the Law; Joshua's own immediate obedience is seen in his speeches to the Israelite commanders and to the Transjordanian tribes, and the Transjordanians' affirmation of Joshua's leadership echoes Yahweh's assurances of victory. The Israelites cross the Jordan River through the miraculous intervention of God and the Ark of the Covenant and are circumcised at Gibeath-Haaraloth (translated as hill of foreskins), renamed Gilgal in memory (Gilgal sounds like Gallothi, I have removed, but is more likely to translate as circle of standing stones). The conquest begins in Canaan with Jericho, followed by Ai (central Canaan), after which Joshua builds an altar to Yahweh at Mount Ebal (northern Canaan) and renews the Covenant. The covenant ceremony has elements of a divine land-grant ceremony, similar to ceremonies known from Mesopotamia. The narrative then switches to the south. The Gibeonites trick the Israelites into entering into an alliance with them by saying they are not Canaanites; this prevents the Israelites from exterminating them, but they are enslaved instead. An alliance of Amorite kingdoms headed by the Canaanite king of Jerusalem is defeated with Yahweh's miraculous help, and the enemy kings are hanged on trees. (The Deuteronomist author may have used the then-recent 701 BCE campaign of the Assyrian king Sennacherib in Judah as his model; the hanging of the captured kings is in accordance with Assyrian practice of the 8th century BCE). With the south conquered the narrative moves to the northern campaign. A powerful multi-national (or more accurately, multi-ethnic) coalition headed by the king of Hazor, the most important northern city, is defeated with Yahweh's help and Hazor captured and destroyed. Chapter 11:16–23 summarises the extent of the conquest: Joshua has taken the entire land, almost entirely through military victories, with only the Gibeonites agreeing to peaceful terms with Israel. Joshua 11:18 asserts that the conquest took "a long time" - the Amplified Bible and the Cambridge Bible for Schools and Colleges suggest this was "at least five years". Anglican churchman Charles Ellicott thinks "the war seems to have lasted seven years". the king of Jarmuth, one; the king of Lachish, one; (etc.) (Joshua 12:10-11). Having described how the Israelites and Joshua have carried out the first of their God's commands, the narrative now turns to the second: to "put the people in possession of the land." Joshua is "old, advanced (or stricken) in years" by this time (Joshua 13:1) - "about ninety years of age" in the Cambridge Bible for Schools and Colleges' estimation; Joseph Benson refers to an estimate that he was 83, but the Jamieson-Fausset-Brown Bible Commentary says that he was "probably above a hundred years old". This land distribution is a "covenantal land grant": Yahweh, as king, is issuing each tribe its territory. The "cities of refuge" and Levitical cities are attached to the end, since it is necessary for the tribes to receive their grants before they allocate parts of it to others. The Transjordanian tribes are dismissed, affirming their loyalty to Yahweh. By the end of chapter 21, the narrative records that the fulfilment of God's promise of land, rest and supremacy over the enemies of the Israelites was complete. The writer of the Letter to the Hebrews makes reference to Joshua and the promise of rest in Hebrews 4:8. The tribes to whom Moses had granted land east of the Jordan are authorized to return home to Gilead (here used in the widest sense for the whole trans-Jordan district), having faithfully 'kept the charge'  of supporting the tribes occupying Canaan. They are granted "riches ... with very much livestock, with silver, with gold, with bronze, with iron, and with very much clothing" as a reward (Joshua 22:1-9). Joshua, in his old age and conscious that he is "going the way of all the earth", gathers the leaders of the Israelites together, "perhaps at Timnath-serah, or possibly at Shiloh"  and reminds them of Yahweh's great works for them, and of the need to love Yahweh (Joshua 23:11). The Israelites are told - just as Joshua himself had been told  - that they must comply with "all that is written in the Book of the Law of Moses" (Joshua 23:6), neither "turn[ing] aside from it to the right hand or to the left" (i.e. by adding to the law, or diminishing from it). Joshua charges the people to remain faithful to Yahweh and the covenant, warning of judgment if (or when) Israel were to leave Yahweh and follow other gods. The hypothetical "if" is used in the New International Version, Revised Standard Version, Jerusalem Bible and Common English Bible; the predictive "when" is used in the Geneva Bible, King James Version and New King James Version. Joshua meets again with all the people at Shechem in chapter 24 and addresses them a second time. He recounts the history of God's formation of the Israelite nation, beginning with "Terah, the father of Abraham and Nahor, [who] lived beyond the Euphrates River and worshiped other gods" (Joshua 24:2). He invited the Israelites to choose between serving the LORD who had delivered them from Egypt, or the gods which their ancestors had served on the other side of the Euphrates, or the gods of the Amorites in whose land they now lived. The people chose to serve the LORD, a decision which Joshua recorded in the Book of the Law of God, and he then erected a memorial stone "under the oak that was by the sanctuary of the Lord" in Shechem. The oak is associated with the Oak of Moreh where Abram had set up camp during his travels in this area. Thus "Joshua made a covenant with the people, literally "cut a covenant", a phrase common to the Hebrew, Greek, and Latin tongues, and derived from the custom of sacrifice, in which the victims were cut in pieces and offered to the deity invoked in ratification of the engagement". There were no Levitical cities given to the descendants of Aaron in Ephraim, so theologians Keil and Delitzsch suppose the land may have been at Geba in the territory of Benjamin: "the situation, 'upon the mountains of Ephraim', is not at variance with this view, as these mountains extended, according to Judges 4:5, etc., far into the territory of Benjamin". The Book of Joshua is anonymous. 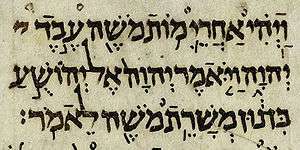 The Babylonian Talmud, written in the 3rd to 5th centuries CE, was the first attempt to attach authors to the holy books: each book, according to the authors of the Talmud, was written by a prophet, and each prophet was an eyewitness of the events described, and Joshua himself wrote "the book that bears his name". This idea was rejected as untenable by John Calvin (1509–1564), and by the time of Thomas Hobbes (1588–1679) it was recognised that the book must have been written much later than the period it depicted. There is now general agreement that Joshua was composed as part of a larger work, the Deuteronomistic history, stretching from Deuteronomy to Kings. In 1943 the German biblical scholar Martin Noth suggested that this history was composed by a single author/editor, living in the time of the Exile (6th century BCE). A major modification to Noth's theory was made in 1973 by the American scholar Frank M. Cross, to the effect that two editions of the history could be distinguished, the first and more important from the court of king Josiah in the late 7th century BCE, and the second Noth's 6th century BCE Exilic history. Later scholars have detected more authors or editors than either Noth or Cross allowed for. The prevailing scholarly view is that Joshua is not a factual account of historical events. The apparent setting of Joshua is the 13th century BCE; this was a time of widespread city-destruction, but with a few exceptions (Hazor, Lachish) the destroyed cities are not the ones the Bible associates with Joshua, and the ones it does associate with him show little or no sign of even being occupied at the time. Given its lack of historicity, Carolyn Pressler, in her 2002 commentary for the Westminster Bible Companion series, suggests that readers of Joshua should give priority to its theological message ("what passages teach about God") and be aware of what these would have meant to audiences in the 7th and 6th centuries BCE. Richard Nelson explains: The needs of the centralised monarchy favoured a single story of origins combining old traditions of an exodus from Egypt, belief in a national god as "divine warrior," and explanations for ruined cities, social stratification and ethnic groups, and contemporary tribes. The overarching theological theme of the Deuteronomistic history is faithfulness and God's mercy (and their opposites, faithlessness and God's wrath). In Judges, Samuel, and Kings, Israel becomes faithless and God ultimately shows his anger by sending his people into exile, but in Joshua Israel is obedient, Joshua is faithful, and God fulfills his promise and gives them the land. Yahweh's war campaign in Canaan validates Israel's entitlement to the land and provides a paradigm of how Israel was to live there: twelve tribes, with a designated leader, united by covenant in warfare and in worship of Yahweh alone at single sanctuary, all in obedience to the commands of Moses as found in Deuteronomy. Joshua takes forward Deuteronomy's theme of Israel as a single people worshiping Yahweh in the land God has given them. Yahweh, as the main character in the book, takes the initiative in conquering the land, and it is Yahweh's power that wins battles (for example, the walls of Jericho fall because Yahweh is fighting for Israel, not because the Israelites show superior fighting ability). The potential disunity of Israel is a constant theme, the greatest threat of disunity coming from the tribes east of the Jordan, and there is even a hint in chapter 22:19 that the land across the Jordan is unclean and the tribes who live there are of secondary status. Land is the central topic of Joshua. The introduction to Deuteronomy recalled how Yahweh had given the land to the Israelites but then withdrew the gift when Israel showed fear and only Joshua and Caleb had trusted in God. The land is Yahweh's to give or withhold, and the fact that he has promised it to Israel gives Israel an inalienable right to take it. 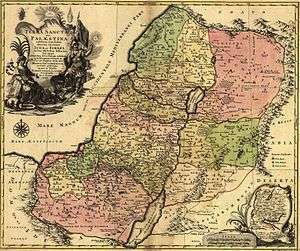 For exilic and post-exilic readers, the land was both the sign of Yahweh's faithfulness and Israel's unfaithfulness, as well as the centre of their ethnic identity. In Deuteronomistic theology, "rest" meant Israel's unthreatened possession of the land, the achievement of which began with the conquests of Joshua. Joshua "carries out a systematic campaign against the civilians of Canaan — men, women and children — that amounts to genocide." In doing this he is carrying out herem as commanded by Yahweh in Deuteronomy 20:17: "You shall not leave alive anything that breathes". The purpose is to drive out and dispossess the Canaanites, with the implication that there are to be no treaties with the enemy, no mercy, and no intermarriage. "The extermination of the nations glorifies Yahweh as a warrior and promotes Israel's claim to the land," while their continued survival "explores the themes of disobedience and penalty and looks forward to the story told in Judges and Kings." The divine call for massacre at Jericho and elsewhere can be explained in terms of cultural norms (Israel wasn't the only Iron Age state to practice herem) and theology (a measure to ensure Israel's purity as well as the fulfillment of God's promise), but Patrick D. Miller in his commentary on Deuteronomy remarks, "there is no real way to make such reports palatable to the hearts and minds of contemporary readers and believers." Obedience vs. disobedience is a constant theme. Obedience ties in the Jordan crossing, the defeat of Jericho and Ai, circumcision and Passover, and the public display and reading of the Law. Disobedience appears in the story of Achan (stoned for violating the herem command), the Gibeonites, and the altar built by the Transjordan tribes. Joshua's two final addresses challenge the Israel of the future (the readers of the story) to obey the most important command of all, to worship Yahweh and no other gods. Joshua thus illustrates the central Deuteronomistic message, that obedience leads to success and disobedience to ruin. The Deuteronomistic history draws parallels in proper leadership between Moses, Joshua and Josiah. God's commission to Joshua in chapter 1 is framed as a royal installation, the people's pledge of loyalty to Joshua as successor Moses recalls royal practices, the covenant-renewal ceremony led by Joshua was the prerogative of the kings of Judah, and God's command to Joshua to meditate on the "book of the law" day and night parallels the description of Josiah in 2 Kings 23:25 as a king uniquely concerned with the study of the law — not to mention their identical territorial goals (Josiah died in 609 BCE while attempting to annex the former Israel to his own kingdom of Judah). Joshua and the Israelites were able to defeat the people at Ai because Joshua followed the divine instruction to extend his sword (Josh 8:18), just as the people were able to defeat the Amalekites as long as Moses extended his hand that held "the staff of God" (Ex. 17:8–13). ↑ McNutt 1999, p. 42. ↑ "JOSHUA, BOOK OF - JewishEncyclopedia.com". ↑ Dorsey, David A. (1991). The Roads and Highways of Ancient Israel. Johns Hopkins University Press. ISBN 0-8018-3898-3. ↑ Coogan 2009, p. 162. Creach, Jerome F.D (2003). Joshua. Westminster John Knox Press. ISBN 9780664237387. Curtis, Adrian H.W (1998). Joshua. Sheffield Academic Press. ISBN 9781850757061. Harstad, Adolph L. (2002). Joshua (in series, Concordia Commentary). Arch Books. ISBN 978-0-570-06319-3. McConville, Gordon; Williams, Stephen (2010). Joshua. Eerdmans. ISBN 9780802827029. McConville, Gordon (2001). "Joshua". In John Barton; John Muddiman. Oxford Bible Commentary. Oxford University Press. ISBN 9780198755005. Nelson, Richard D (1997). Joshua. Westminster John Knox Press. ISBN 9780664226664. Pressler, Carolyn (2002). Joshua, Judges and Ruth. Westminster John Knox Press. ISBN 9780664255268. Younger, K. Lawson Jr (2003). "Joshua". In James D. G. Dunn; John William Rogerson. Eerdmans Commentary on the Bible. Eerdmans. ISBN 9780802837110. Achtemeier, Paul J; Boraas, Roger S (1996). The HarperCollins Bible Dictionary. HarperSanFrancisco. Campbell, Anthony F (1994). "Martin Noth and the Deuteronomistic History". In Steven L. McKenzie; Matt Patrick Graham. The history of Israel's traditions: the heritage of Martin Noth. Sheffield Academic Press. ISBN 9780567230355. Campbell, Anthony F; O'Brien, Mark (2000). Unfolding the Deuteronomistic history: origins, upgrades, present text. Fortress Press. ISBN 9781451413687. Day, John (2002). Yahweh and the Gods and Goddesses of Canaan. Sheffield Academic Press. ISBN 9780826468307. De Pury, Albert; Romer, Thomas (2000). "Deuteronomistic Historiography (DH): History of Research and Debated Issues". In Albert de Pury; Thomas Romer; Jean-Daniel Macchi. Israël constructs its history: Deuteronomistic historiography in recent research. Sheffield Academic Press. ISBN 9780567224156. Finkelstein, Israel; Silberman, Neil Asher (2001). The Bible Unearthed. Free Press. ISBN 9780743223386. Knoppers, Gary (2000). "Introduction". In Gary N. Knoppers; J. Gordon McConville. Reconsidering Israel and Judah: recent studies on the Deuteronomistic history. Eisenbrauns. ISBN 9781575060378. Laffey, Alice L (2007). "Deuteronomistic history". In Orlando O. Espín; James B. Nickoloff. An introductory dictionary of theology and religious studies. Liturgical Press. ISBN 9780814658567. Naʾaman, Nadav (2005). Ancient Israel and Its Neighbors: Collected Essays: Volume 2. Eisenbrauns. ISBN 9781575061139. Van Seters, John (2000). "The Deuteronomist from Joshua to Samuel". In Gary N. Knoppers; J. Gordon McConville. Reconsidering Israel and Judah: Recent Studies on the Deuteronomistic History. Eisenbrauns. ISBN 9781575060378. Abu-Sitta, Salman H. (2004). Atlas of Palestine, 1948. Palestine Land Society. Aharoni, Yohanan (1979). The Land of the Bible; A Historical Geography. The Westminster Press. ISBN 0-664-24266-9. Dever, William G. (2003). 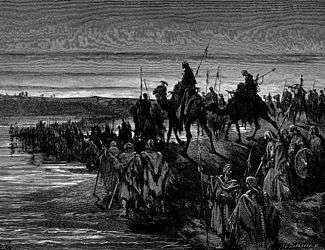 Who Were the Early Israelites and Where Did They Come From?. Wm. B. Eerdmans. ISBN 0-8028-0975-8. Finkelstein, I. and Z. Lederman (eds.) (1997). Highlands of Many Cultures: The Southern Samaria Survey. Tel Aviv University Institute of Archaeology. ISBN 965-440-007-3. Curtis, Adrian (2009). Oxford Bible Atlas, Fourth Edition. Oxford University Press. ISBN 9780199560462. Kallai, Zecharia (1986). Historical Geography of the Bible; The Tribal Territories of Israel. The Magnes Press, The Hebrew University. ISBN 965-223-631-4. Na'aman, Nadav (1986). Borders and Districts in Biblical Historiography. Simor, Ltd. ISBN 965-242-005-0.